A very bright shed with double windows to the front-Malvern build exceptional sheds guaranteed to last a lifetime. 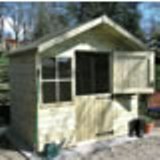 The Ludlow from Malvern is a secure yet light shed which has been built to last. This apex roof shed is available in 9 sizes from 8'x6' to 12'x10'. The chalet style shed features 12mm tongue and groove cladding as standard with 2"x2" framing throughout with a spirit based timber treatment. The shed features fully framed, ledged and braced 35" central door, with three heavy duty attractive antique hinges and a 3 lever mortice lock. The door is flanked by two front joinery made windows to provide plenty of light. This pretty shed is finished with a front roof overhang. Various options are available with these diverse sheds including pressure treated deal, 20mm deal, cedar cladding, pressure treated slatted roof, cedar slatted roof, toughened glass and floor bearers. With all the options you are sure to find a perfect high quality shed at the right price.